Marloes Sands Beach01437 775603work BeachA huge expanse of sand at low tide with rocks and interesting cliff formations; rock pools can be found at the western end of the beach. At high tide the beach can disappear altogether, but at low tide, there’s plenty to explore. The rock strata has divided the beach up into numerous little ‘bays’ for even more privacy. 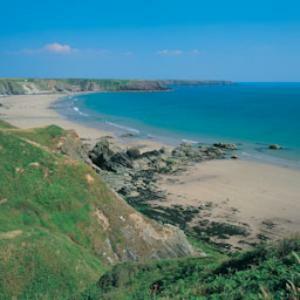 Climb over the rocks at the western end to discover Albion Sands, a perfect little sandy beach. At low tide you can see all that’s left of a wrecked ship - a prop shaft sticking out of the sand. Green Coast and Seaside Award. Parking is approx. 0.5 mile from the National Trust car park. Dogs are allowed. Nearest facilities can be found in Marloes village which has a pub, restaurant and café/bar. A huge expanse of sand at low tide with rocks and interesting cliff formations; rock pools can be found at the western end of the beach. At high tide the beach can disappear altogether, but at low tide, there’s plenty to explore. The rock strata has divided the beach up into numerous little ‘bays’ for even more privacy. Climb over the rocks at the western end to discover Albion Sands, a perfect little sandy beach. At low tide you can see all that’s left of a wrecked ship - a prop shaft sticking out of the sand.